Channel 4 has invested £600,000 in training a fresh band of TV presenters and reporters with disabilities and Paralympic sporting experience to work alongside experienced anchors such as Clare Balding and Jonathan Edwards, when live coverage of the Games begins next week. 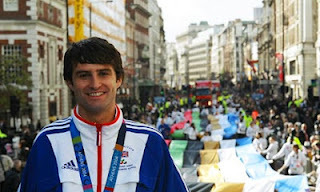 It is also unveiling a system of screen graphics, invented by Giles Long (pictured), one of the UK's most successful Paralympic swimmers, based on human figures to depict conditions such as dwarfism, amputations and brain damage. These will help viewers to understand, at a glance, why athletes who often appear so different compete against one other. Called the Lexi Decoder system, it works on a traffic light principle. Diagrammatic figures showing missing limbs are coloured green, yellow, orange or red, depending on the level of disability – green for no impairment, red for severe. Channel 4, which paid around £5m for the television rights to the London Paralympics, said research showed that many people were confused by the system of classification. It hopes that improved understanding will boost audiences for the lavish nine-day coverage, running from a breakfast show to late at night. Giles Long, 36, from Wood Green, north London, who won 20 major medals as a butterfly swimmer, including a gold in Atlanta in 1996, invented the Lexi system and took it to Channel 4 – using a ballpoint pen and notepad to explain his idea – after it won the rights in January 2010 over the BBC. Long said: "There is a gap in understanding. I realised in Beijing people thought the result of one swimming race was unfair because the Chinese athlete had no legs. The way to think about classifications is the weight bands in, say, boxing. You never see a flyweight and heavyweight boxing each other. Grouped together, Paralympic athletes face a common challenge." The graphics work, he said, because "it's about boiling down what people sitting on the sofa need to know in an instant, at the point of the race. "You see diagrammatic figures everywhere – tube, bus, road signs, we are using everyday language but applying it an accessible way. I know the people competing in the Games won't find them shocking at all. If you want to compete, you have to go through an assessment. It's integral to sport." The Lexi Decoder will be used only as a 20-second shot of information, and will not be attached individually to athletes. It covers just eight sports: swimming, athletics, cycling, table tennis, wheelchair rugby, basketball and volleyball. The classification numbers for races will also use the traffic light system. The coding attached to each race will also be colour coded. Long, who owns the rights to the Lexi Decoder, will also be reporting from the poolside for Channel 4 and has been trained over the past 18 months with attachments at the BBC and Sky. Channel 4 sifted through 350 online applications to find disabled reporters or presenters to train. The finalists were taken to week-long "boot camps" at the National Film and Television School and seven novices, such as Rachel Latham, were given contracts, at around £20,000 a year, to prepare, plus fees for working on events, such as the late night Road to the London Paralympics Extra and BT World Cup Rugby. Latham, 23, applied after she had to retire from Paralympic swimming at 20 because of an injury sustained in Beijing. She joined the C4 scheme after finishing a degree in Sheffield in 2011. Her training included shadowing Adrian Chiles at ITV. Latham said her experience and disability – her left arm and shoulder were injured at birth – make a difference. "Athletes are comfortable with me. It is natural to talk about classification, I can explain it with ease. There can be a problem with having too much information, but that's where the training came in," said Latham. Alison Walsh, C4's disability manager, said it had achieved its target of a 50:50 split between disabled and able-bodied on-screen presenters, but said C4 had learned lessons after its coverage of World Athletics last autumn was criticised because of some inexperienced contributors. Georgie Bingham, an experienced sports presenter who will anchor C4's daily afternoon show, has been paired with former marine Arthur Williams, who is paralysed below the waist. Bingham said: "It makes huge sense to me. It's a brilliant thing. He will be bringing in his wheelchair to explain how it works in the wheelchair races. It is not without a bit of risk, but Arthur is young, enormously bright." For BBC2's Beijing Paralympic coverage, 56% of viewers were aged over 55, with a bias towards women. The opening ceremony peaked at 2.9 million viewers, with the closing one attracting 990,000. The average audience for the 7pm-8pm The Games Tonight programme was 1.7 million, and 20 million people watched at least five minutes. C4's coverage is on a completely different scale: the biggest ever live event in its history. Walsh is confident that her team of new reporters will work well. "They have trained as hard as the athletes. If they succeed, they deserve gold medals."